Pattern recognition (at least 20 images). Pre-sentencing packet (3 known tenprint cards). Known tenprint card to unknown inked impression. AFIS side by side comparison. HOW IT WORKS: Purchase your downloadable proficiency test and we will send you an email on distribution day with login credentials and download instructions. 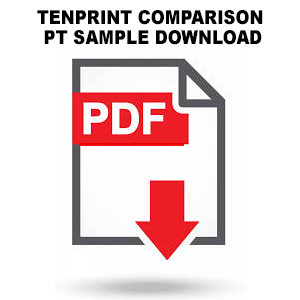 Simply, login to our secure download portal where you will find test materials required to complete your Tenprint Proficiency Tests. THIS SAMPLE DOCUMENT IS FOR TEST DEMONSTRATION PURPOSES ONLY. THIS DOCUMENT HAS BEEN COMPRESSED FOR EASY WEB DOWNLOAD. IMAGES CONTAINED IN THIS DOCUMENT ARE NOT COMPARISON QUALITY IMAGES AND DO NOT ACURATLEY REPRESENT RS&A PRODUCTION TEST IMAGES. REPORTS AND REPORT DATA CONTAINED IN THIS DOCUMENT ARE FOR SAMPLE PURPOSES ONLY.